PHOTO CAPTION: "Photo Courtesy Flickr." 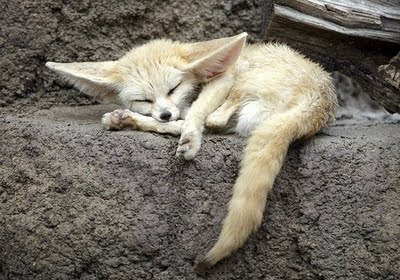 Fennec fox sleeping. Welcome to Harmony of the Heart! The blog where you can get your dose of inspiration for the week. Feel free to check out the inspirational stories, videos, poems, photos, great links and more! We encourage you also to view our new sidebar on the right for many new inspirational resources (videos, newsreels, etc.). Dig those big ears! Looks like he could fly, kinda like Dumbo in canine version. Great blog! Take Care!